In case you did not know, I am a HUGE fan of New Glarus’ “Belgian Red” Cherry Lambic, so this news is like heaven to me. I’ll have to pick up a few bottles of the Red to bring back to Colorado, as only New Glarus makes beer like this! Reason to start drooling. 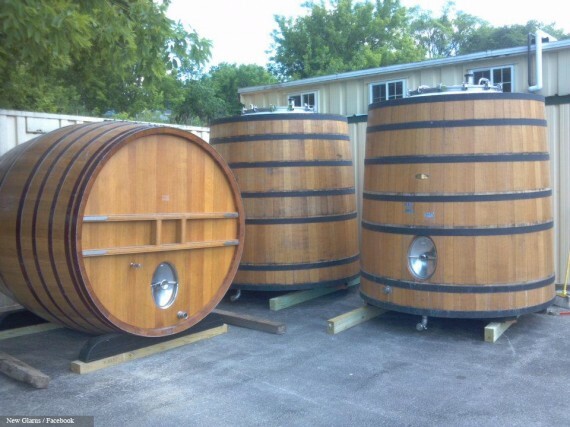 New Glarus Brewing Co. (New Glarus, WI) is adding a dedicated lambic cellar. A lambic is a spontaneously fermented beer, exposed to wild yeasts, instead of cultivated/controlled strains. In Belgium, brewers like Cantillion allow the wild yeast from around Brussels in the air “breeze in” and ferment the beer. In the case of New Glarus, the wild yeast and bacteria that will spontaneously ferment (and funk up) the beer resides in the wood of the vessels seen above. Lambic style beers give rise to other styles, like gueuze, faro, & kriek beers. If you have not tried one, they are plentiful within the craft beer industry today, so go experiment!